Maxthon Cloud Browser (Maxthon Cloud) is a powerful web browser, that uses a unique, innovative dual-core design (that uses both Webkit and Trident), providing fast, efficient and reliable web experience. Furthermore, It has multiple tools that make your web experience more enjoyable, such as ad-blocker, resource sniffer, screen capture tool, night mode, reader mode, and cloud functionality which syncs user data, history, and tabs across any platform their choice. Quick start, quick opening of web pages, and quick response these three aspects make Maxthon 5 one of the fastest browser at the moment. 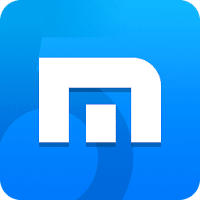 Maxthon 5 uses resource optimization, hardware acceleration, pre-rendering, pre-start, multi-process processing technologies， that greatly optimizing the browser speed, Webkit and Trident dual-core provides you with a more effective browsing experience. Cloud Push: Supports sending text, images, websites/links and tabs to Mac, Android and Windows operating systems. Cloud Share: Supports sharing text, images, websites/links and files with friends. Cloud Download: Supports downloading files in various formats and uploading them to 'My Cloud' for backup on any device. My Cloud Tabs: Lets you pick up where you left off by automatically syncing your tabs to Android, iOS or Mac devices. Cloud Sync: Syncs account data (Favorites, Settings and Magic Fill data) to other devices. Local video player supports keyboard shortcuts to control play status. Fixed the issue of the upper right corner close button being blocked under window status in special cases. Fixed the issue of the desktop will appear address bar when locking the browser through shortcuts key under special cases. Fixed the issue of the two addons can be expanded at the same time on the sidebar. Fixed the issue of can’t publish content on Sina Weibo addon. Fixed the issue of can’t make a comment on mindorks website. Fixed the issue of Passkeeper’s exception website list did not remove duplicate matters after importing the data automatically. Fixed the issue of progress will be roll back when downloading some files. Fixed the issue of external tools can’t be displayed in toolbar’s original place after restarting the browser. Disclaimer: Direct downloads for the lastest version of Maxthon Cloud Browser 5.1.2.1000 are provided by the official software's author, we can't guarantee safety, availability or download speed. Moreover, we don't and we won't provide any pirated/illegal versions or tools. We recommend you to avoid it as these methods can harm your device. If you like the software, buy it to support the developers. (We provide software discounts for many worldwide brands).